It takes only a couple of steps to implement beacons for using them with Loquiz games. We have written before how beacons generally work. To get started with them on Loquiz, buy a couple of beacons. Estimote as well Kontakt.io are producing really fine ones. Or find out if your cooperation partner venue has some. Then install a beacon scanner into your smart-device. Or install a beacon provider own app. Make sure to turn smart-device bluetooth on. Scan for beacons. A foolproof way to scan is to be near only one beacon. In cases a good way is to take a rest of the bunch far away from you, turn them off or go outdoors with the one. 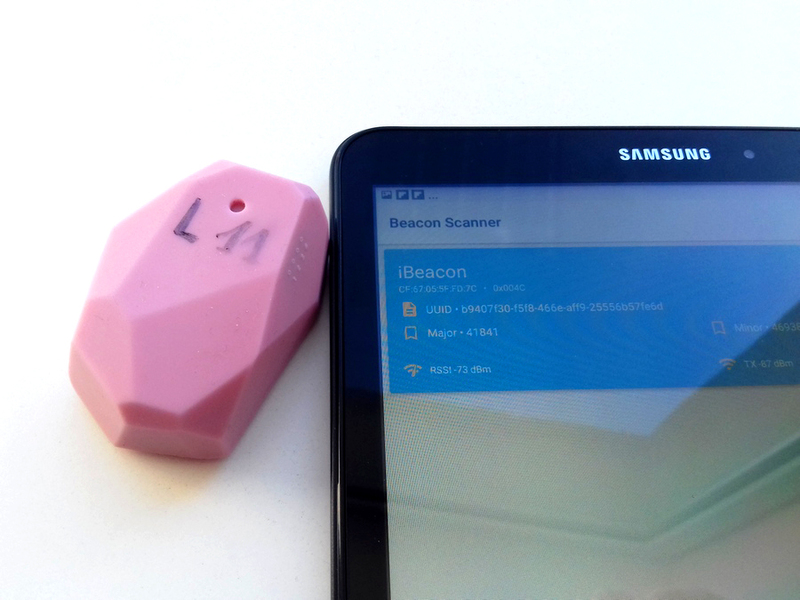 Scan for beacons with the beacon scanner of your choice. If you have only one beacon in the range, only one should show up on your list. You get three identifiers for the beacon. UUID; major and minor. You need to copy/paste or write down all of these three. Loquiz is checking for all three ID-s and activates the question only if all of them are found and correct. The range is the area where the question activates: near or far. Test in your surroundings as walls, crowd and other obstacles change how well smart device “hears” the signal the beacon advertises. This changes the real distance of near and far. Note that signal spreads three-dimensionally, through floors in buildings. So a question about a specific room on the II floor might me activated on the I floor. A final step is to create a game with this beacon activated question in it. For outdoor games it is wise to make the question pin invisible and put it far away from the game grounds. The task where to find a object hiding the beacon can be shared via chat, in the after answer comments of a question, or in welcome text. Other option is to set radius for this pin 0m. This is handy when activation needs to take place where GPS does not reach- indoors, in tunnels, under bridges. When you are ready building the game, make sure to test it to see how your setup works.